NEW YORK, October 10, 2018 (Newswire.com) – For the fourth year in a row, MACIAS PR is recognized as one of the best PR firms in the USA. The award is based on media and branding campaigns it led for clients in healthcare, technology, financial and nonprofit sectors. 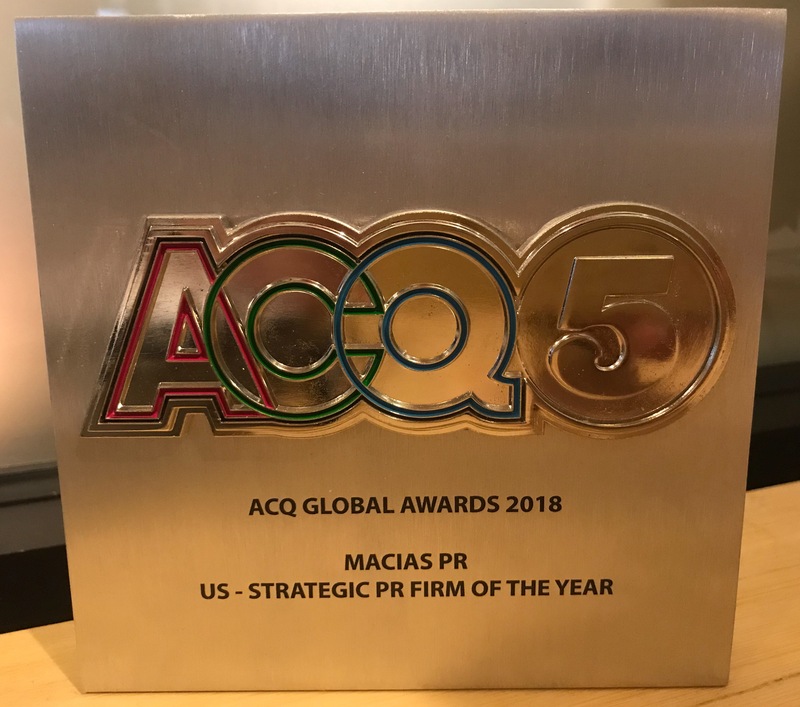 This latest recognition comes from the ACQ5 Global Awards, which named MACIAS PR the 2018 Strategic PR Firm of the Year – USA. The award is given by PR and marketing peers based on media deliverables, industry expertise, and creativity. More than 120,000 firms and publicists were nominated around the globe. MACIAS PR was the only marketing and PR firm selected for the award. This is the second year in a row that MACIAS PR was named the ACQ5 Strategic PR Firm of the Year. In 2017 and 2016, journalists with Finance Monthly named MACIAS PR the Financial PR Firm of the Year – USA and the 2015 PR Consultant Firm of the Year. The founder of MACIAS PR – Mark Macias – said the firm’s strategy is rooted in journalism, editorial and programming principles that lead to coverage. MACIAS PR secured prominent news stories for its clients with CNBC, People Magazine, ABC 6 in Philadelphia, Forbes, Men’s Health Magazine, CBS News and others over the last 12 months. Macias was also quoted as a PR, branding, and crisis communications expert in several publications, including CNBC, Australia’s Sydney Morning Herald, Media Post. In July, CNBC turned to MACIAS PR for crisis advice involving one of the country’s largest pizza chains – Papa Johns. Macias told their readers how the crisis could have been better handled with a pro-active approach (link to story). Macias expanded on that story with a blog on the firm’s website, giving business owners and CEOs more in-depth crisis advice (crisis advice article). MACIAS PR continued to grow in 2018 with new clients in politics, healthcare, digital health, entertainment, and tech. The firm launched and led media and branding campaigns for a general election Congressional campaign, consumer tech product, a new dating app and one of the country’s fastest-growing digital health platforms. MACIAS PR also launched a marketing and media campaign for a new Off-Broadway play on the final hours of Elvis Presley’s life – “The King, The Final Hours” – which opens in New York City on Oct. 17. Macias says the publicity his firm secured for the play has helped drive early ticket sales. The play has been featured on NY1, Brooklyn Eagle, Broadway Box, Rock and Roll Globe, Broadway World, Talkin Broadway, and others. Macias says his firm will expand into theater PR and marketing beginning in 2019. Since 2006, the ACQ Global Awards recognizes innovators and industry leaders across a spectrum of industries. The firms and businesses are nominated and selected by industry peers who understand the challenges and accomplishments within PR and marketing.